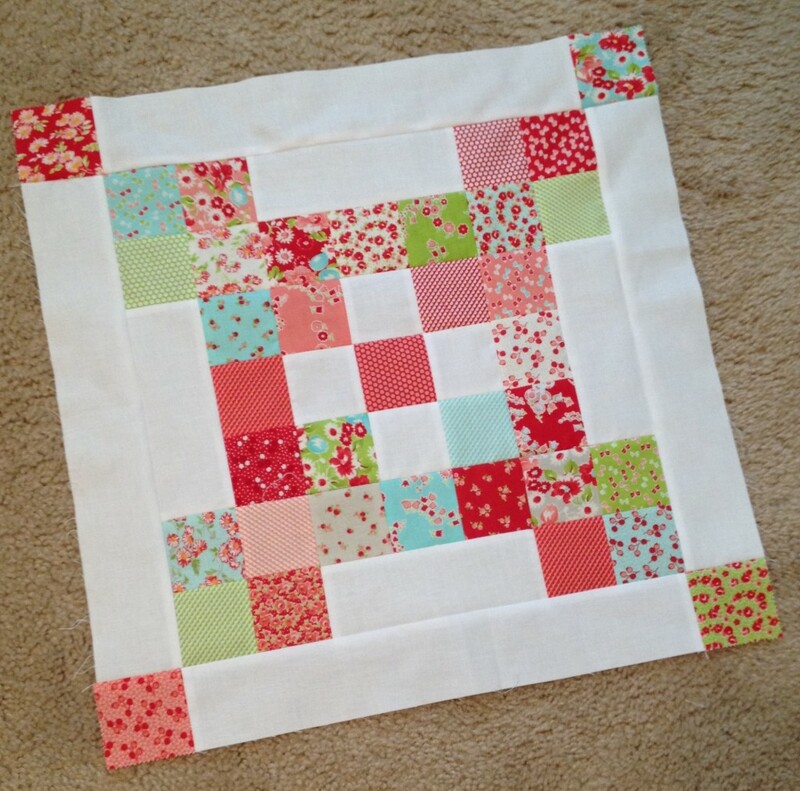 Hi there, Quilty Friends! My name is Celeste and I am so excited to be making my very first contribution to Moda Bake Shop. Thanks for joining me. 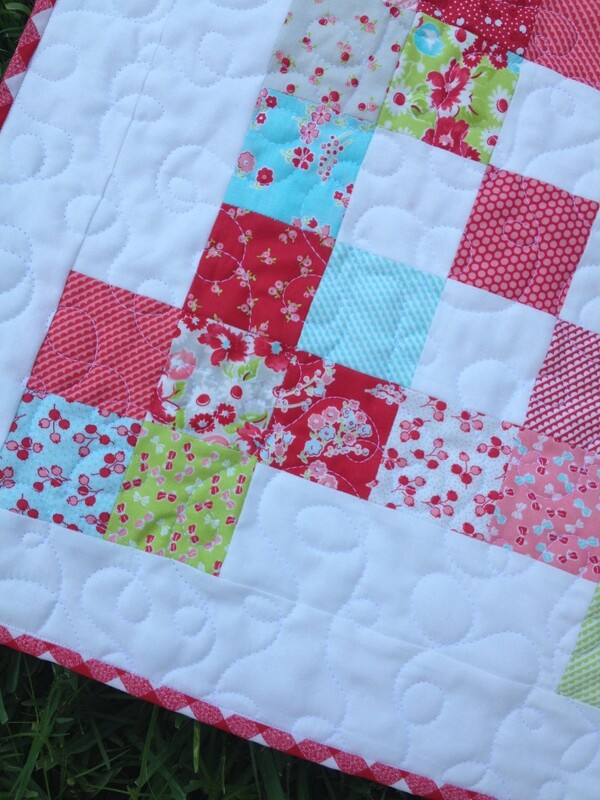 I have been quilting for around 14 years and still love every minute of it. 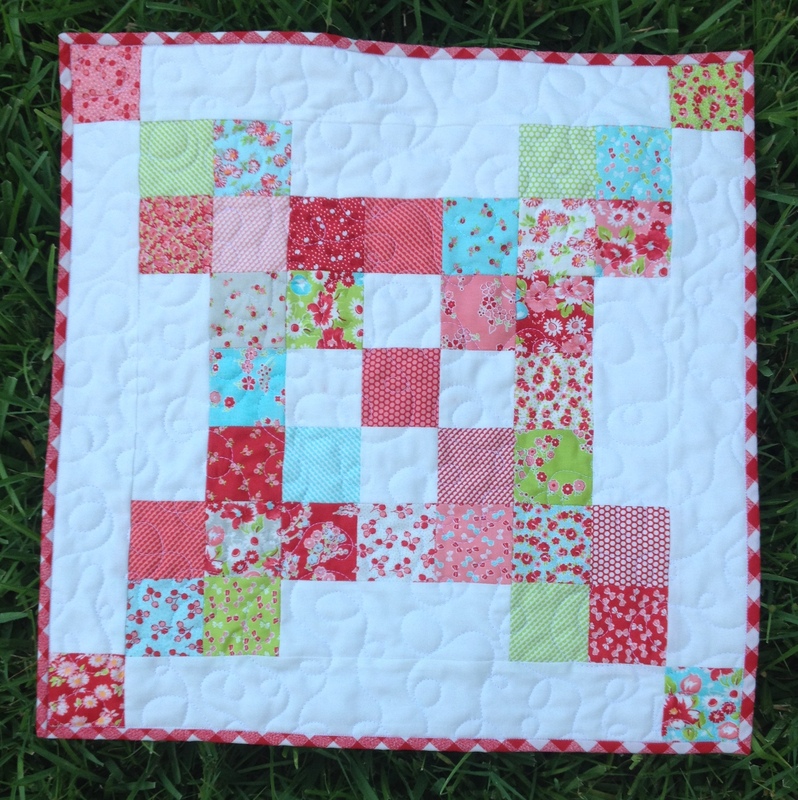 You can find me posting daily on Instagram with all kinds of quilt fun! I also have a blog and an Etsy shop. 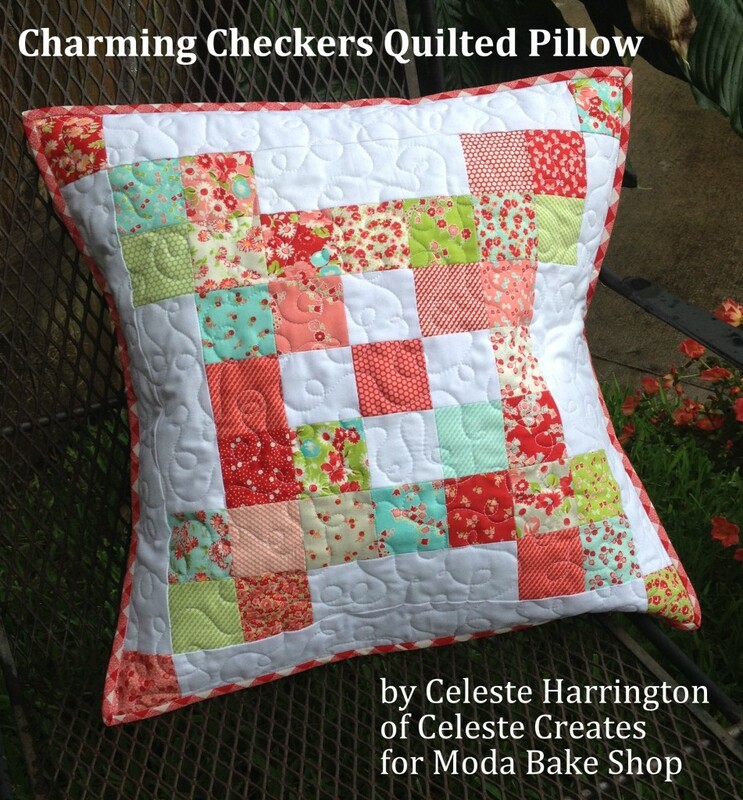 Today I am sharing a fun quilted pillow made from just one Moda Mini Charm Pack. 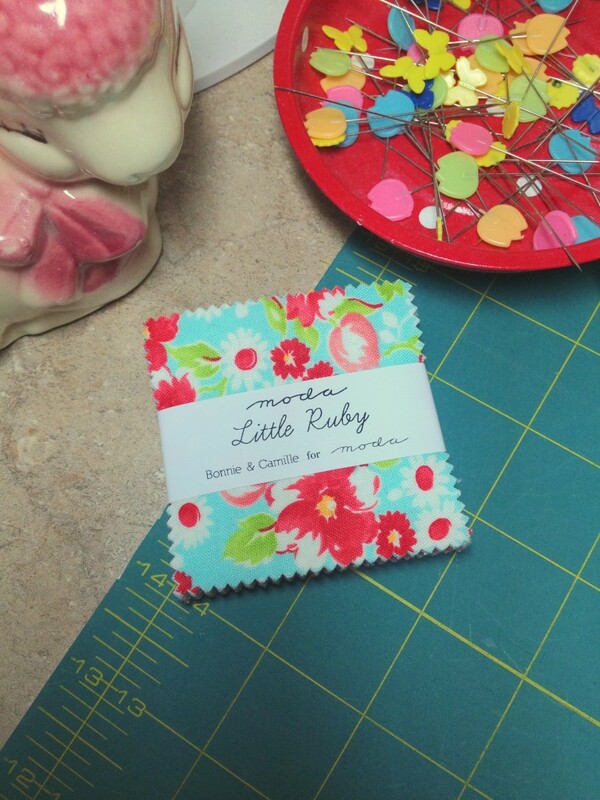 These little sweet treats are always just so hard to resist and I love projects that take a precut and just a little bit of extra fabric! This pillow cover finishes at 18″ square. Unwrap your pretty little Moda Mini Charm Pack. 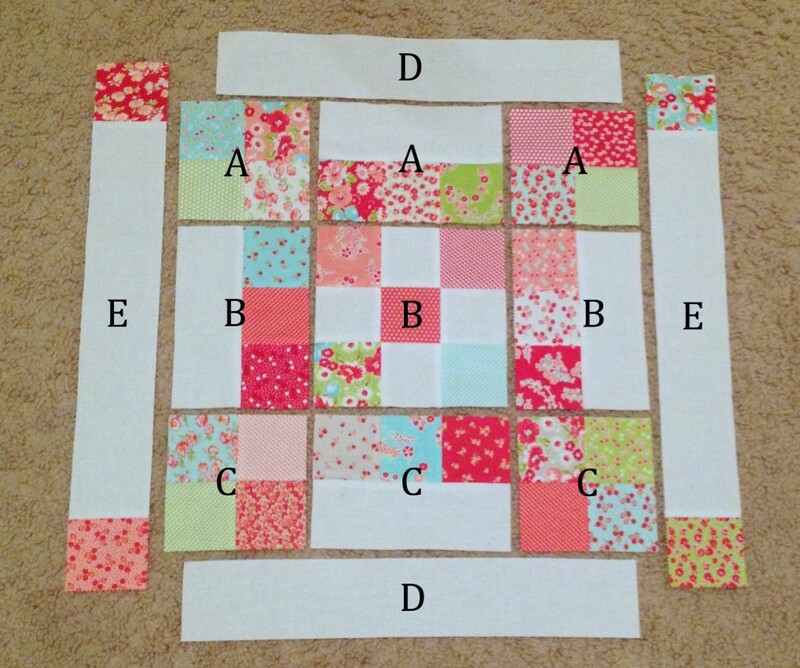 Next you want to take your mini charm pack and start laying out the squares in a pleasing arrangement. This is always fun because you get to play with the all the fun prints. I like to take a photo of my design after doing this. It’s a great way to see the colors from a different perspective. Once you are happy with your arrangement, keep that photo. After I have decided on my final arrangement of mini charms, it’s time to start sewing them together. I like to put the sections together on my design board and put it next to my machine. The following photo shows how to piece together the different sections. While constructing this pillow cover, I pressed all seams open. It is also very helpful to trim each of the above units to size before assembling the complete top. Now it’s time to sew all the sections together. 1. Assembles rows A, B and C, pressing seams open. 2. Sew together all rows, pressing seams open. This will create a 14.5″ square block. 3. 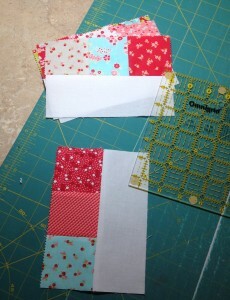 Add strips labeled D, pressing seams out toward D strips. 4. Add strips labeled E, pressing seams out toward E strips. Now you should have a beautiful block measuring 18.5″ unfinished. The first time I made this block, I used it to create a quilted and bound pillow cover. When making a quilted pillow cover, I like to create a “quilt sandwich” with the finished pillow top before doing some free motion quilting. I use a layer of Warm and White batting and some muslin or inexpensive white “backing”. 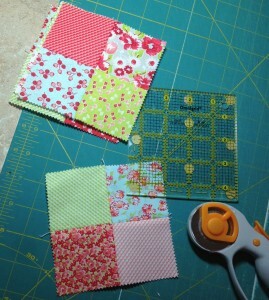 Then I do some pretty free motion quilting (my favorite). When you are finished quilting, trim your batting and “backing” flush with the edges of the pillow top. 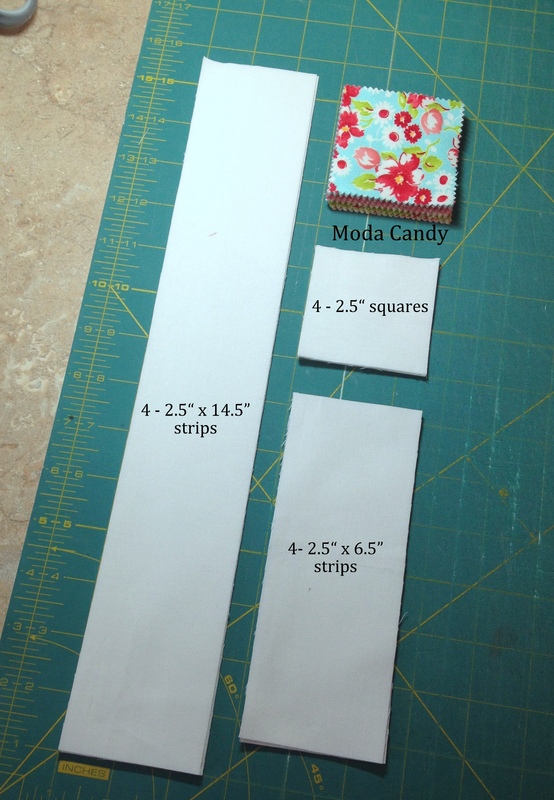 -From the 3/4 yard of backing fabric, cut 2 rectangles measuring 18.5″ x 24″. -Fold each rectangle in half, so that the folded rectangles measure 18.5″ x 12″. -Topstitch along the folded edge of both rectangles. 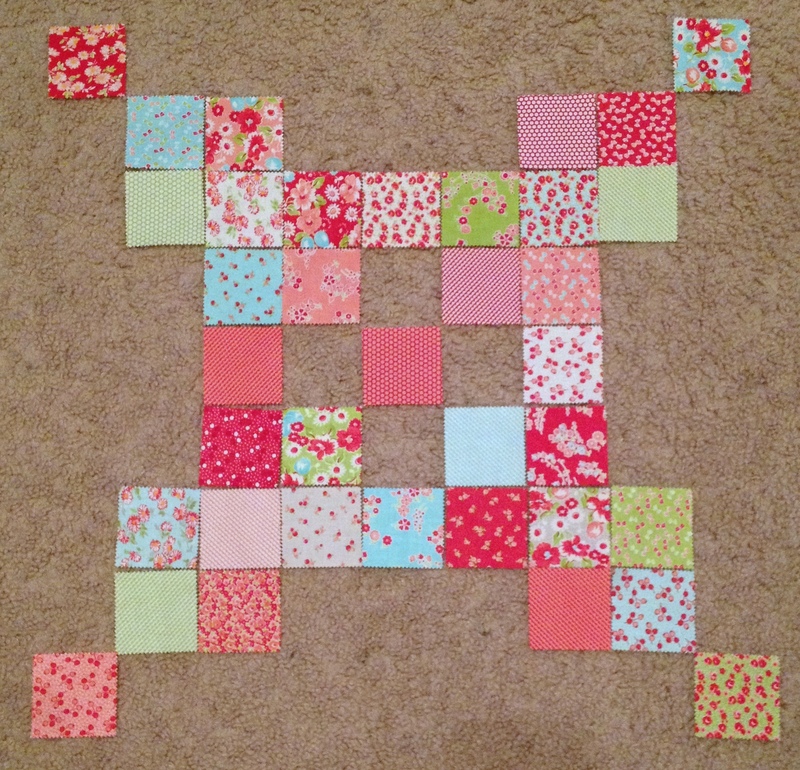 -Lay your pillow top right side down and place the folded rectangles on top. The raw edges should match the raw edges of the pillow front and the folded edges should overlap in the middle. -Pin layers well and stitch all the way around the outside of the pillow cover using an 1/8″ seam allowance. 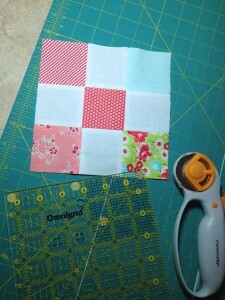 -Bind quilted pillow cover using your preferred method. This makes a lovely finished pillow cover every time! I think you will love the results! Again, thank you so much for stopping by for my very first Moda Bake Shop tutorial! I had such fun. I hope you enjoy making this! This entry was posted in Easy, Home Decor, Moda Candy/Mini Charms/Petit Fours and tagged Bonnie and Camille, Celeste Creates, Little Ruby. I love this pattern. Could it be made bigger using layer cakes. I love this little pillow and the name! Perfect use of a mini charm pack! Thank you for sharing! Lovely. What is your design board size and is that batting on top? Any instructions to make one? Thank you Robin! My design board measures about 17″ x 19″. I made it very quickly one day because I wanted a design board that sits on top of my wooden TV tray (the kind from Target). I keep this next to my machine so I can lay out a block while I sew. I used an old piece of chip board that used to be something else and wrapped the fabric around, securing with hot glue. I also hot glued batting to the top. I may remake it and do a tutorial on my blog. 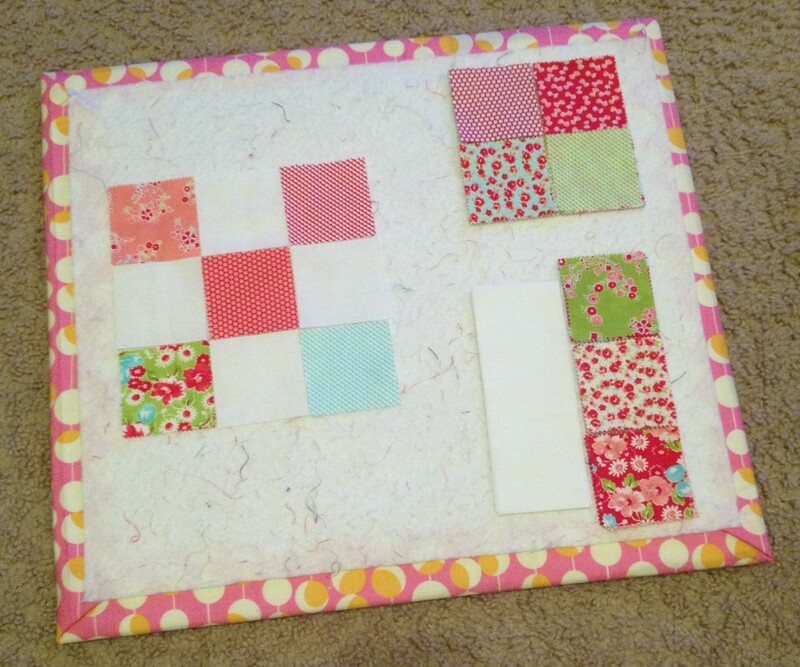 Also, Lori Holt from Bee in My Bonnet has a great tutorial for a design board. Thank you. Great idea and so helpful. I love this pattern! What size pillow form does it fit? I guess I don’t know how much larger the pillow cover needs to be than the pillow form. Thank you! Thank you, Tara! It is so easy and fun! This pillow fits an 18″ pillow form. I usually make my pillows very close to the size of the form so they won’t look saggy. I hope this helps! Would love to see what you make. Oh, what a lovely use of a charm pack! And thanks for your very clear instructions to make an envelope back. Thank you for this tutorial – great for using the mini-charms! Your pattern could also make pillows for a seasonal gift (once the school year starts I do not have a lot of spare time). I, too, am grateful for the easy, precise back instructions. Look forward to your design board tutorial; please post it with Moda!